Long time, no blog… but I’m back! Its been a long couple of weeks, including the half term break – lots has happened, and thankfully, quite a bit of drawing and painting has been done too! The first set of paintings I played with were all of the same bird – The Gyrlin. 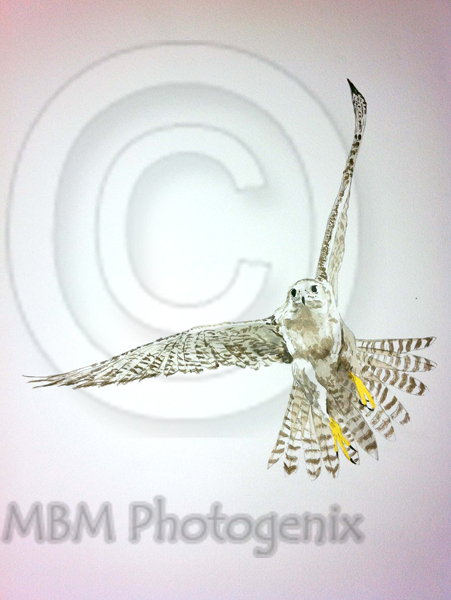 I drew the bird 3 times – firstly onto a canvas which already had a background in place. 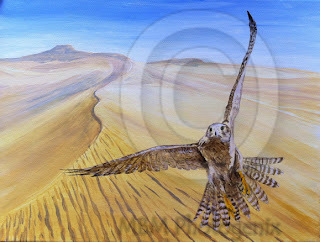 Now with the bird in position, I will be able to develop the whole image further, by accentuating the bird in the foreground and knocking back the background to make it hazy in the distance. Gyrlin over sand dunes – AcrylicSecondly, I re-drew the same image and painted it again, in acrylic paint on paper. I was interested to see how different the result would be on a different surface. 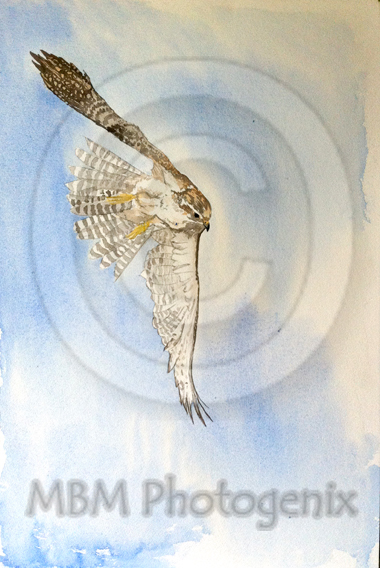 To push this experiment further still, I drew the same bird again – this time onto thick water colour paper. What has surprised me the most, is that using different mediums on a variety of surfaces, the birds have come out almost identical! In all 3 paintings, it is just the first layer and they all need developing (however, the latter 2 might just stay as they are!) I enjoyed painting the same image over again – each time, I became more familiar with the shape and form of the bird…after all, it is the beautiful shape made by the wings in flight that inspired me to paint this in the first place! Yesterday, I was in the mood to draw an owl. 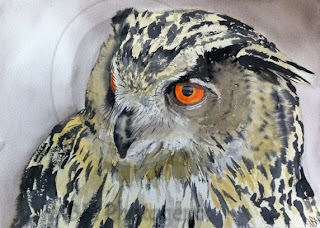 This European Eagle Owl is resident at the Screech Owl Sanctuary in Cornwall. I’ve discovered that I really enjoy the flow and ‘looseness’ of watercolour for painting owls…I start with the eye and the beak which I like to be accurate and precise, then move on to the fluffy feathers using much free-er brush strokes. Happy with my owl, I just had to have another go at Rogue, the Gyrlin. She is such a stunning bird, especially in flight, I love the shapes and angles her body contorts into as she powers through the air, twisting and turning on a sixpence! 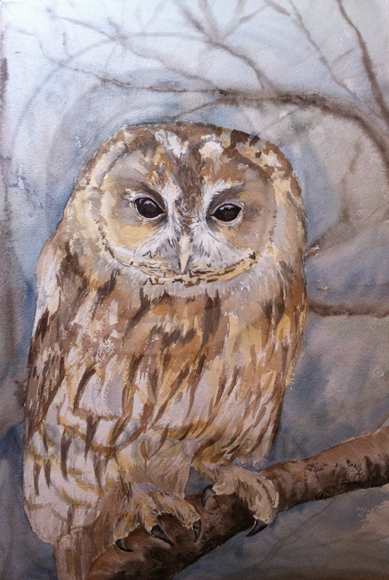 Today’s venture into the paint box took me back to the owls… Here we have two British species, the Tawny Owl and the Barn Owl…both SO cute, you could snuggle up for a cuddle!! 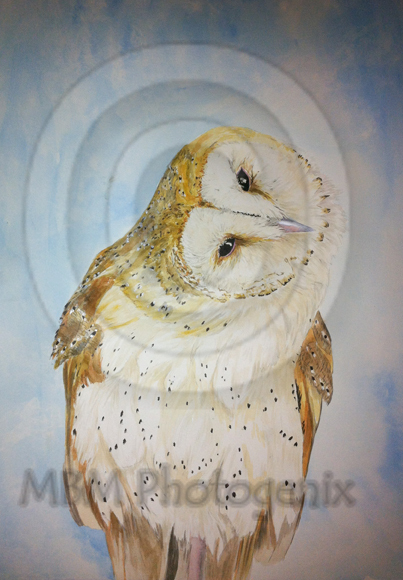 The Tawny owl is painted in watercolour, the Barn Owl in Acrylic. (Choice of paint medium at this point in time is based on the paper I used for the drawing…that’s purely down to what I have available in my folder. As I get more accustomed to the behaviour of each medium, I am starting to make a more informed choice of paper when I do my initial drawings!) 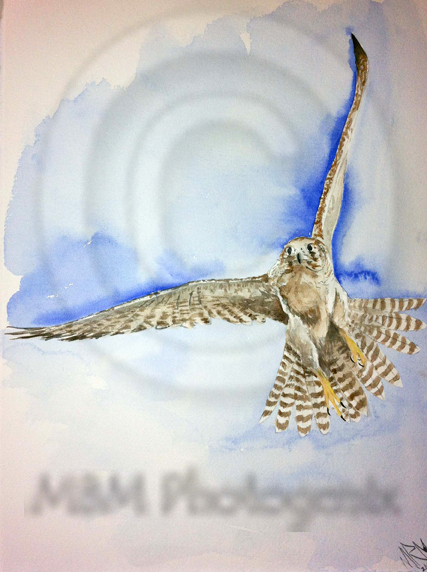 I think this time last year, the thought of painting birds in watercolour would have terrified me…now I’m preferring watercolour to acrylic. So, there you have it, my efforts for the past couple of weeks. Considering how much has been going on, I’m amazed how much I managed to squeeze in. Ooh, just remembered…I spent a whole day drawing last week, so I have the luxury of a whole batch of images ready to paint as and when time permits!!!! 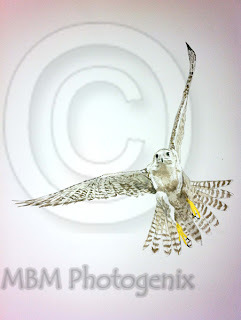 A nice mixture of bird portraits (buzzards, hawks and owls) and of course flying hawks and even a pair of fighting starlings! Watch this space…!